I sat down the other day to write my next entry about worm composting to discuss how easy it is, how great it is, etc. etc. After all, I’ve been successfully raising my worms for over a year. But before I began writing, I decided to visit my little worms to see how they were doing. 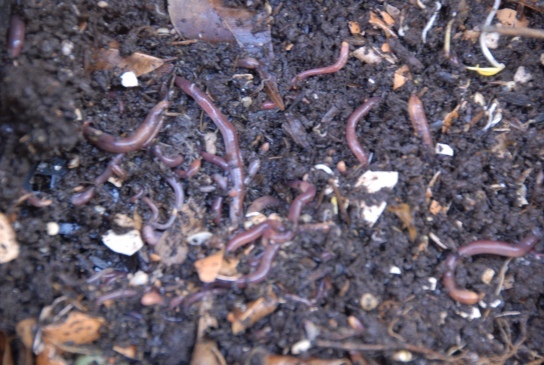 Healthy worms in compost bin. I hadn’t fed them in about week or so and thought they might be hungry. And to my chagrin, I found that my worms were DEAD, GONE!!! Oh no, what did I do wrong? 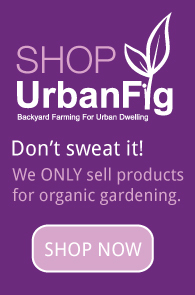 My heart sank, my urban farmer confidence shrunk, and I felt so sad. I noticed a few things: ants, a white fuzzy mold, tiny white, thin worms (were those new baby red worms?) and lots of critters running around that weren’t worms. I called Malibu Urban Worms (the place where I bought my once vibrant worms over a year ago). I awaited their response with baited breath. Meanwhile, I looked up “dead worms in worm composter” in Google and got a few answers, but none that satisfied me. I wanted to speak to the expert myself. I may have fed the worms too much food (typical of a New Orleanian, always trying to overfeed those we love). 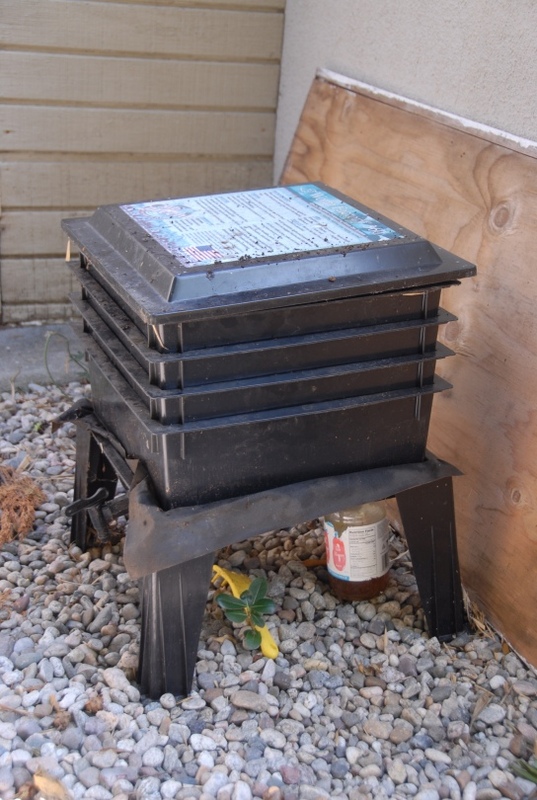 This is a no-no for worms because it can cause the bin to overheat and kill the worms. Usually a little pile of food in one corner of the bin is enough for 7-10 days or more. I had put two piles in each corner. Obviously too much. I need to keep the temperature gauge (that usually comes with the worm bins) inside the bin so that the temperature is always visible when feeding or checking the worms. The ideal temperature is between 40˚F – 80˚F. If the temperature begins to approach 80 degrees, you can cool the worms off by adding a little cold water into the bin. Have no fear. Just like with gardening, we learn from trial and error. I bought some new worms at our local nursery, gave them some food and am ready to help them flourish. And for the other activity that I observed in the worm bin? The tiny little white worms? They are called enchytraeids or pot worms. They are beneficial in that they assist in breaking down food material in the bin. The ants? They come into worm bins when the bin is a little too dry. Ants do not hurt the worms and will go away when the moisture returns. The fuzzy white mold? This is just part of the food breaking down. Just stir it into the rest of the worm castings. The other critters? They are a normal part of a worm bin ecosystem. It has been a couple of weeks now and my new worms are fabulous. Soon I’ll have more castings and worm tea to feed my garden.